"Lying in a hammock drinking mango juice. Wanking." The Do It Yourself artwork is from 'Do It Yourself' (plaster bandage, clay, cellulose and acrylic, 1996). 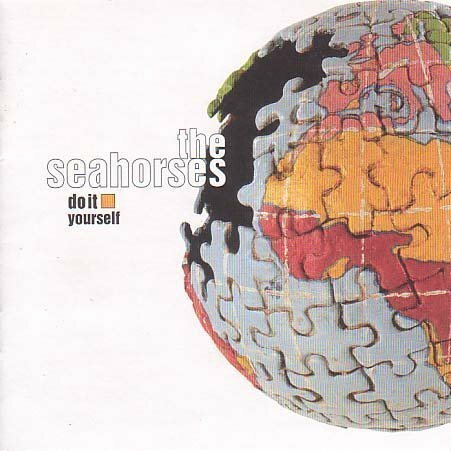 Left: Front cover of Do It Yourself. On the Second Coming tour, Ian Brown's singing was getting pilloried in the press, while John Squire was being proclaimed as the last guitar hero. Squire felt, to a degree, that he was doing it all on his own, and one of the last things that Brown said to him was "Do it yourself". Right: 'Do It Yourself' (plaster bandage, clay, cellulose and acrylic, 1996), from the Manchester exhibition, May 2004. "A reaction to 'Second Coming'. I wanted to make it light, airy. I got a basketball, covered it in Vaseline, then in plaster. When it dried, I sawed it in half. 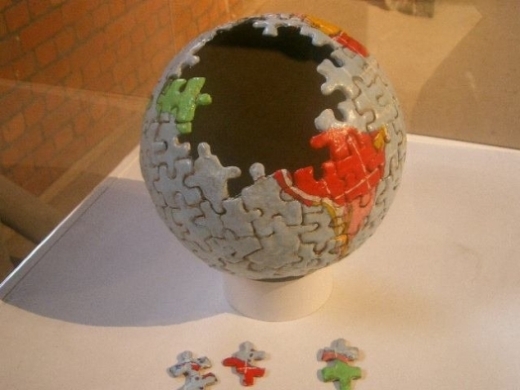 I photocopied a jigsaw and cut out the pieces in paper, laid them in clay and used them as a template. It took days, so I didn't finish the back. There are huge geographical errors on the dark side !" (John Squire speaking to Select Magazine, November 1997).